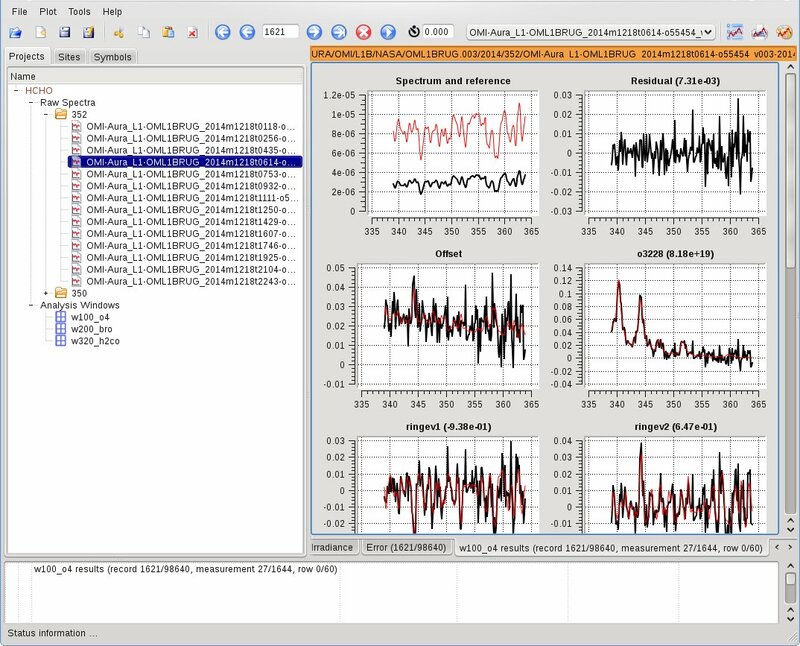 QDOAS is a cross-platform application which performs DOAS retrievals of trace gases from spectral measurements (satellite, ground-based, mobile or aircraft-based instruments). The software is available for Windows, Linux and Mac OS operating systems. The software evolves along with the measurement techniques and DOAS research, and has been extensively validated in different campaigns and algorithm comparisons. The friendly user interface, flexibility and the robustness of the algorithms largely contribute to QDOAS' success in the world. To use the software, please register first. QDOAS is free and open source software, distributed under the terms of the GNU General Public License (GPLv2). Please mention the authors in the acknowledgements when publishing results obtained using QDOAS. The main components of the Graphical User Interface are organized in multi-page panels with a fixed arrangement and tab-switched access to the authors different pages (configuration project/analysis property sheets, fitting results). Export plots as png or jpg, or export plot data as a CSV file. This tool can be used to process large numbers of files in a batch. It can be used with qdoas, convolution, ring and usamp configuration files (xml format). The output is fully configurable. Analysis results and various data related to the measurements can be saved to ASCII, HDF-EOS5 or netCDF files. Please refer to the user manual for a complete overview.